When you have what may seem like a million and one things to do, coping with a headache is not likely to be top on your list. 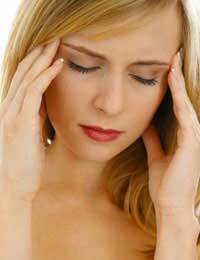 Many people still view headaches as a minor disturbance and not something to be dealt with immediately. The physical and psychological effects of headaches are huge, however, and are more likely to worsen if headaches don't receive prompt attention, particularly if they have become chronic. Downplaying and minimising headache pain can leave you feeling worse about yourself when you can't handle it. If you pretend headache pain isn't serious, you'll feel that much worse when you can't handle that 'annoying little headache.' Headaches and migraines can be chronic and debilitating; the medical profession recognises that they affect an enormous number of people and lead to a great deal of stress in regards to coping with the demands of work and home. The other concern is that if you don't take your head pain seriously, others won't as well, and you'll feel even more pressure to pretend that your head pain is mild. Headaches are a real and significant burden on your own well-being and collectively, the wellness of society. Sadly, the trivialising of headaches as a minor fleeting pain means that many people are afraid to cite headache pain as a reason for needing to take some time out for self-care. The idea that a person should 'tough it out' or ignore head pain is an unfortunate one and the sooner you show that it's a serious problem, the sooner others can follow your lead. You may be someone who is wary of medications and drugs, perhaps because of side effect fears or because you think you should be able to handle headache pain alone. The problem with some headaches is that if you wait for the pain to go away, it will likely get worse before it gets better and by taking medication at the first sign of head pain, you can often prevent the headache from progressing. Part of headache management is acknowledging that you are not superman or superwoman and that you can and should obtain drug treatment when needed. Suffering in silence is no way to live on a day-to-day basis. Hiding your head pain from your boss and colleagues may seem like a good idea, because giving the impression of robust health can seem synonymous with high work quality. In fact, the opposite is true. If you are suffering from headaches and nobody else at work is aware of your struggle, they may assume that any deterioration in your work quality is due to other reasons. It may seem like you're not caring about your work or if you frequently are upset or confused from head pain and nausea, they may even believe you have a drug problem or some other health condition. The stress of hiding headaches can also make them worse and lead to more sick days. Be open about your problems and more likely than not, your workplace can accommodate any special needs. If your headaches are triggered by anxiety or a particularly stressful event such as bereavement, for example, ignoring the pain and source of it will probably serve to prolong your headaches. Consider talking to a counsellor about your feelings and worries. Even if your anxiety is around an issue that you are not able to immediately resolve, simply talking to a warm and caring counsellor can be helpful. Your doctor is the primary point for healthcare information, diagnosis and treatment for your headaches. It's important that you aren't embarrassed and afraid to speak to him or her about head pain. If you are truly uncomfortable with your doctor, perhaps it's time to seek help with another medical doctor? Your doctor shouldn't judge you or brush off your concerns and he or she should be thorough when discussing your symptoms and anxiety over head pain. Ultimately, your treatment begins when you take the first step in dealing with head pain, which is to acknowledge that it exists and isn't simply a 'little headache.' Don't ignore your head pain. Try to look at it this way: if you're not feeling your best, you can't be your best to everyone else. Despite what may be a hectic schedule and a multitude of commitments in your day, make today the day you take your headaches seriously and seek treatment. I have chronic headaches caused by neck pain (I have a headache every single day but of varying severity).I do have to just ignore it because I've had the problem for 10 years and gone to countless doctors and none of them have been willing to give a diagnosis or even take the time to attempt to find out what's wrong. They just tell me to 'go home & take a paracetamol' which doesn't work and is just minimising the problem.So maybe some GP's should read your article cause in my experience they seem to think that headaches are a minor problem and something that the person should just 'live with'. I spend my days dosed up on over-the-counter ibruprofen (can't take the stronger stuff) but this is beginning to no longer work.I really fear the day when it stops working because I can barely function now on some days - I really struggle to get through work and other aspects of my life.I want to have a baby soon but I'm really scared because I won't be able to take ibruprofen anymore and I don't have a clue how I will cope with being in that much pain. So yes, some of us do have to ignore it and just live with it.